When a tree is cut down only a quarter of it (25%) will actually turn into it paper the rest will be used for other purposes. The average paper consumption for Americans is about 700 pounds each year which is more than 6 times the global average (it is estimated at 110 pounds.) If we want convert the annual consumption of Americans to a lifetime consumption of trees then that would translate to an average of 465 trees. If the above amount of paper is not recycled it will end-up into landfills causing environmental pollution at a rate of 3.3 cubic yards per ton. 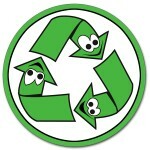 If we all recycle our share of paper we will save around 100 million tons of wood. If Americans recycled all their newspaper that would translate into 250 million of trees a year. The production of recycled paper causes only 25% of the pollution caused from the production of new paper. Less than 15% of Americans do not have access to paper recycling programs (either through curbside collection or drop offs. ) That means that more than 270 million Americans can actually recycle properly if they want to while we work to expand the program to reach everyone! 1993 was the first year that in the US that more paper was recycled than the one dumped into landfills. Around 80 billion of aluminum beverage cans are used each year which is the most common use of aluminum. When aluminum can is recycled we save enough electricity to run a TV set for 3 hours or lit 15 light bulbs of 7 watts a piece for 4 hours . An aluminum can is recycled and back on the shelf in just two months time. When an aluminum can is thrown it will not break down even after 500 years. The amount of aluminum thrown away each year is enough to rebuild our commercial airplane fleet by four times. More than half of the aluminum cans that are produce get recycled. The value of an empty aluminum can is one cent. Two and half million plastic bottles are used every hour in the US with just a quarter of them being recycled. A plastic bag that is not biodegradable can take up to 400 years to be broken down. A ton of plastic being trashed will take over almost 7 cubic yards in a landfill. In the US every year 25 million of Styrofoam cups are thrown away with the majority not being recycled. A glass bottle can take 40 centuries to be broken down if not recycled. Glass can keep getting recycled since it never wears down. In the US only a third of the glass bottles and containers are recycled every year. A 100 watt light bulb can be lit for 4 hours from the energy saved by recycling a glass bottle or power a PC for almost half an hour. The reason that collection points require you to separate glass by color (green, clear and brown) has to do with the fact that the coloring makes the glasses chemically incompatible and impossible to be reprocessed together. Finally you should always keep in mind that recycling is the last step in the loop of the 3 R’s (Reuse, Reduce and Recycling) so always try to implement the first two steps before recycling!